For anyone scarred by memories of watching Bambi as a child, here's something to offset your pain. 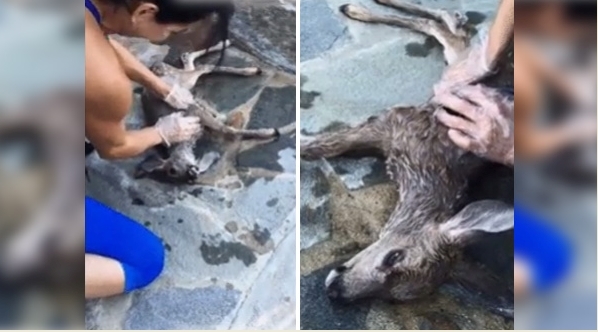 An unidentified woman has performed CPR on a baby deer after it nearly drowned in a swimming pool, and a video captured of the event has proceeded to go viral. In the brief clip, a woman clad in leggings, gloves and a crop top starts performing the CPR on the little animal, while writing flashes across the screen reading: 'So this deer fell in her pool and drowned'. Luckily for the fawn, the woman who owned the pool happened to be a doctor, and so she knew exactly what to do when disaster struck. Alternating between trying to get a heartbeat back and doing some mouth-to-mouth resuscitation, the woman at one point even held the little animal upside down, as if to let some of the water out. Eventually, after around eight minutes of CPR, the baby deer coughed and spluttered its way back to life. The end of the video sees the woman clothe the adorable animal in a pink towel and stroke its head gently. The accompanying caption across the screen reads: 'Yeah, she saved him'. Since the amazing rescue was posted on the Hero Animals Facebook page, it has been viewed more than 1.2 million times. It has also given thousands of viewers a renewed faith in humanity. 'How wonderful to see such determination to save a life, regardless of species,' one person wrote beneath the Facebook post. 'I think this woman is a remarkable human being and has my utmost respect and admiration,' the commenter continued. Others have hailed the woman a 'hero', writing: 'Not many people would go that far to save an animal'. Responses to "Woman gives baby deer CPR after it nearly drowns in a swimming pool "
your article is very good and informative keep sharing.